What I like about this New Zealand Machine, is if you removed the front siren and changed the number plate, you could put it on the streets of Belfast or Rochdale and it would be totally at home. Somehow the red and white livery of New Zealand's F8's spoil the 'classic' Dennis look. It is nice to see how original it is and how it has escaped modernisation. Just look at the size of the original rear view mirror. Just as it should be! So congratulations to those who look after such a wonderful machine. Would it be possible to have some pictures of the ladder fully extended - all 125 feet of it! Added by Barry on 25 February 2007. Thank you for your comments Barry BUT it did not look like this when we got it back from Christchurch as it was still in the "blasphamous" orange and white I will be putting the ladder up this weekend and will take more photos but I doubt that it will be the 125ft. Watch for more Kiwi Dennises to be posted shortly. Added by John Walker on 26 February 2007. Barry, I use to ride this machine, and as a young probationary fireman all of 18 years, I cannot begin to tell you how thrilling it was to be seated in the rear- facing bench seat trying to get dressed as this magnificent piece of fire brigade machinery went screaming down Pitt Street enroute to an inner city call. The siren, like most of the Auckland applicances of the time, was manufactured in the Brigade workshops by the incredibly skilled and dedicated mechanical team. It was driven by a started motor and operated by a floor dip switch on the officer's side or a driver's button on the steering column. The screaming whistle it put out was enough to blast the paint off a car at 50 paces! Added by Pavel Zaremba on 27 February 2007. I went to my first fire call on this appliance as a rookie in 1967 and later drove it as a driver. It has been well restored by the MOTAt team under John Walker's management. Added by David Neil on 01 March 2007. Sorry Barry I did not succeed in getting photos suitable to post last weekend but will try and get it up next weekend in a different location. Added by John Walker on 06 March 2007. Also, memories of a mechanical siren. Ours was fitted atop the tank, behind the cab of our International Harvester 466 Tanker. Like yours, the locals had fitted a 12v Starter Motor, to replace the original 6v motor. And, like yours, it really lifted the crew out of their seats. They are coming back in fashion here now - usually fitted to the front bumpers. Easier on the crews' hearing ! Good to see such a beauty, safely in preservation. Added by Pat Rivers-Bowerman on 23 July 2008. John, you say this is one of three 125' ladders in the museum. What are the other two? Added by Andrew Middleton on 08 October 2010. I noticed that this TL has a mid-mounted Dennis No2 500 IGPM pump, which was not all that unusual on this generation of Dennis-Metz TLs. What seems a bit unusual is the absence of a monitor on the ladder. Why buy a ladder with a built-in pump, if it is not intended to use it as a water tower when needed? Perhaps one of our former riders who actually used this appliance "in anger" can explain? Added by Rob Johnson on 15 October 2013. Rob, she had a monitor alright, I think from memory fitted with a one inch nozzle, the 2¾" hose was always pre-connected and ran back and was flaked in the 'tail gate' locker. The hose was specially manufactured to 150 foot so no couplings could foul on the rounds whilst extending. Added by Pav on 16 October 2013. Added by John Walker on 16 October 2013. I was in the rear faceing crew seat when the whole thing extended itself in chancery street one saturday morning, ooc for about 6 months so the merryweather was pressed into service, top speed 30mph, down hill with a tail wind. Added by Owen Fausett on 14 March 2014. One thing about these ladders fitted with PTO drive pumps has always bothered me. The PTO driven pump needs to be adjusted by running the engine throttle faster or slower - but the mechanical ladder elevation, extension and rotation are also dependent on the road engine. How were they co-ordinated, or did you have to shut down the pump to move the ladder in/out, up/down or to turn it? A lot of TLPs had independently-powered pumps (like the postwar London Merryweathers) but Dennis Metz and Dennis Magirus TLPs seem to have had PTO driven pumps instead. Added by Rob Johnson on 27 November 2017. Added by John Walker on 29 November 2017. Added by Pav on 03 December 2017. Pav: This is one story I have not heard! You just seem to know so much from your various posts that I thought you could answer this one for me. 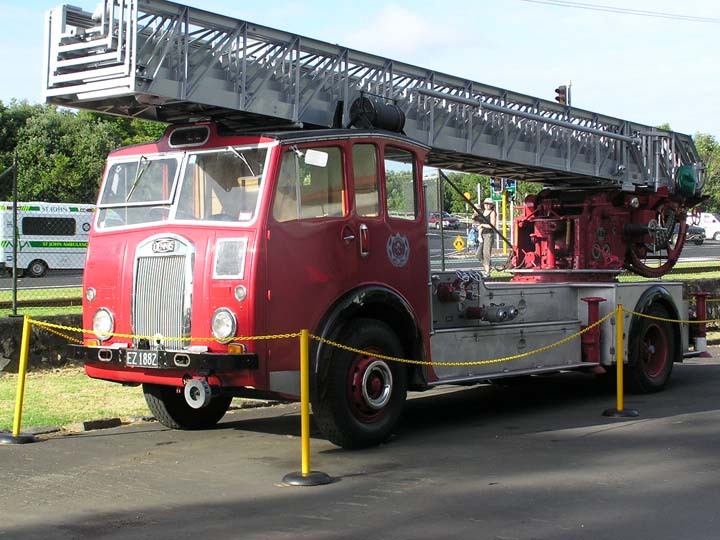 When my home town Darlington bought one of the only two Leyland Firemaster Magirus ladders ever built in 1960, I asked one of the officers there why they did not have a pump built into that enormous empty space in the front of the cab, like the other one which went to Wolverhampton. He replied it was a "silly idea", but never explained why! Added by Rob Johnson on 06 December 2017.